I’ve returned to Kobe exhausted, but in one piece. I’ll be really busy the the next several days since the new JETs are coming, so I have no clue when I’ll be able start writing posts, but in the meantime, here’s a video (not of my own creation). This is Tokyo. Bah. I was on a roll for awhile, but this post took forever. I’ve just had too many things going on. For one, I’m in charge of the three days of orientation for the incoming JETs, who will arrive in the beginning of August, and preparing for that has kept me occupied. I’ve also been busy planning a summer trip. The spring term ended on the 20th, and I’m spending the following week and a half traveling around Japan. Of course, while school doesn’t resume until September, Japanese teachers don’t get any time off in the summer. But fortunately, I have a lot of yearly vacation days to use, and so use them I shall. I’ll be going to Tokyo and up into the mountains. I imagine I’ll come back with a lot less money, but with all sorts of experiences and pictures to share. But before that, I still have at least one old excursion that I’ve wanted to talk about. A few months back, I made a day trip to the town of Ise, east and a little south of Osaka, on the opposite coast. 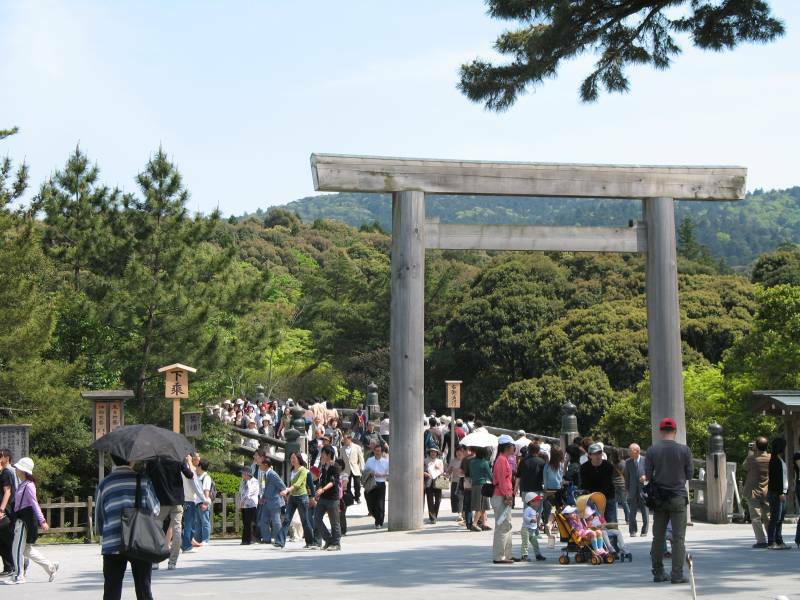 My reason for traveling to Ise – like everyone’s reason for traveling to Ise – was to visit Ise Shrine, whose official name is simply, The Shrine (“Jingū”). 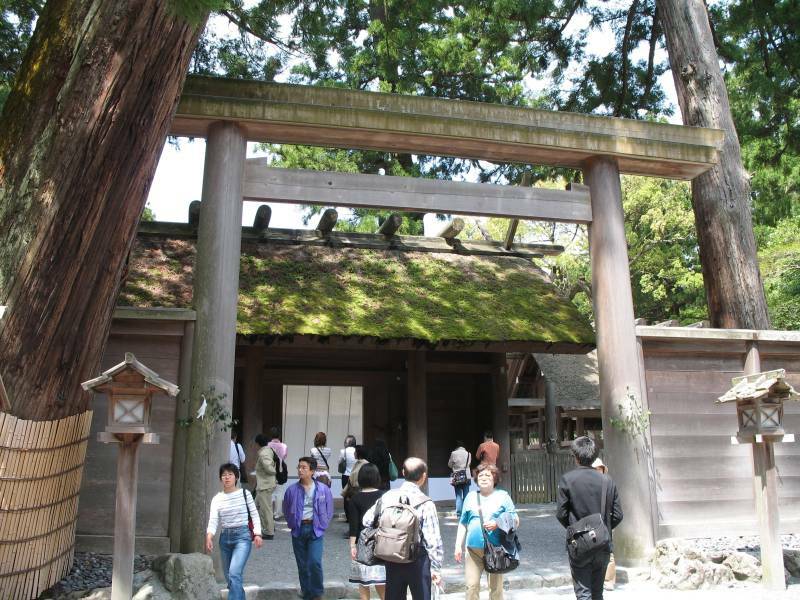 Ise Shrine is dedicated to the kami Amaterasu, the sun goddess and ancestor of the imperial family, according to Shinto belief. Or more precisely, Jingū’s Inner Shrine is dedicated to Amaterasu, while the Outer Shrine is for the goddess of food, shelter, and clothing, who is also charged with caring for Amaterasu. The “inner” and “outer” labels are misleading though, because the two shrines are in entirely separate locations, some four miles away from each other. Before heading to the shrines, I had lunch at Daiki, which is famous for being frequented by the Emperor when he is in town. The restaurant is very relaxed and unpretentious, and serves excellent sashimi and other Japanese food. With my belly filled, I headed to the Outer Shrine. 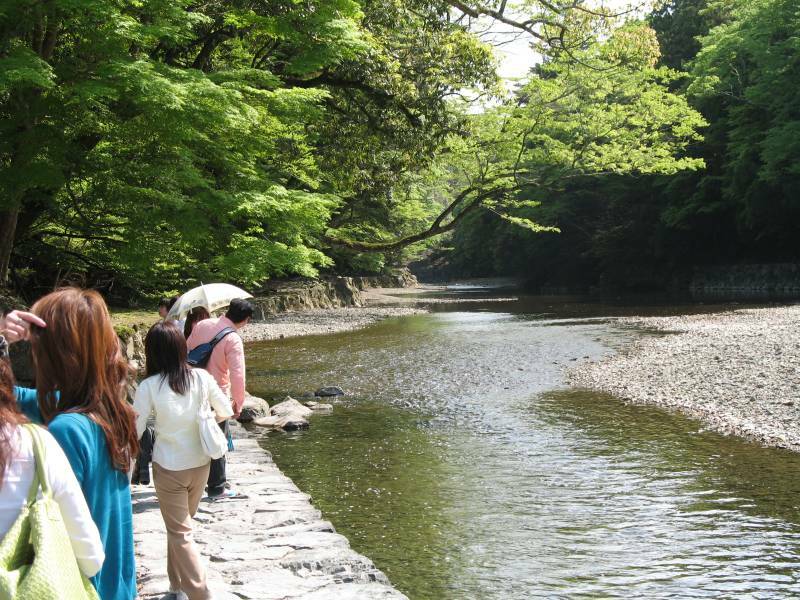 This bridge is the passage between the shrine and the outside world. And this is as close as most people are allowed to get to the shrine itself. Generally, only priests and members of the imperial family get to see the central shrine. But from the right spot, you can see its roof. The architecture predates Chinese influence, and is thus very different from Buddhists temples or even most other Shinto shrines. 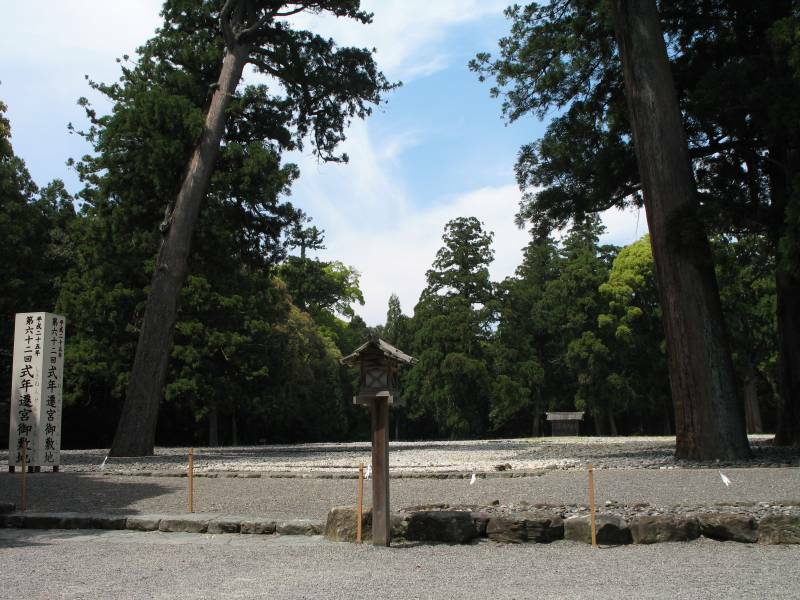 This empty square is right next to the central shrine. All the shrine buildings and even the bridges are completely rebuilt every twenty years, only using traditional methods, and the new buildings – exact replicas – go in the adjacent site (the bridges don’t move). When construction is complete, the kami are ceremonially transfered to the fresh shrines and the old ones are taken down. The white post on the left states that the 62nd reconstruction will take place in 2013. 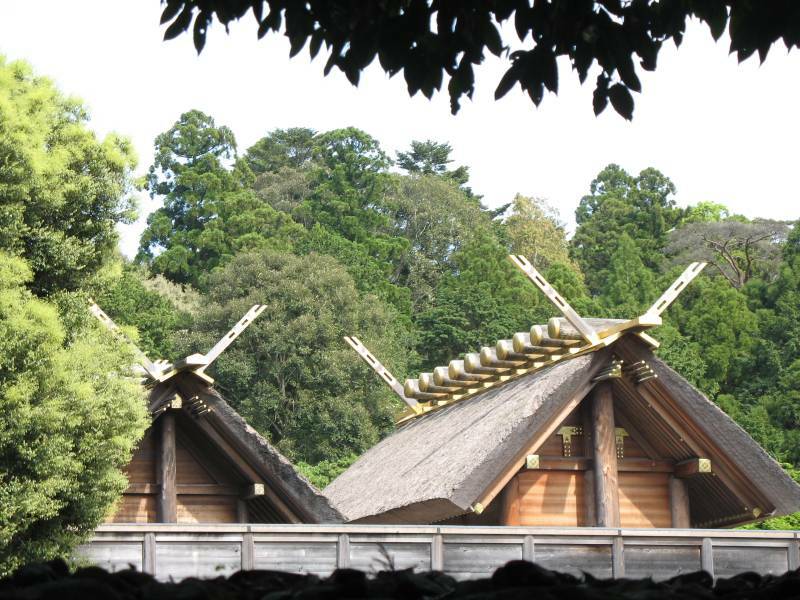 With a few missed cycles, Ise Shrine has been reborn in this fashion for 1,300 years. The shrine was founded earlier than that, though. The official history says 4BC, but most scholars think it’s probably a couple centuries younger. Moving on, this is the bridge to the Inner Shrine. As you can see, it’s much larger and busier than the Outer Shrine. 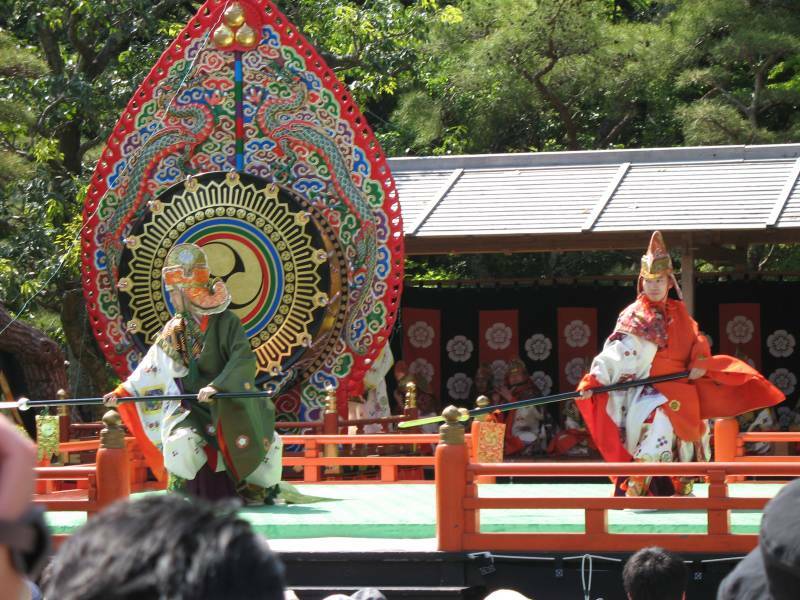 A little past the bridge, there was a stage where ceremonial dances and music were being performed. Unlike the shrines, the performances and even the stage itself showed definite continental influences. Past the stage, a path leads to the river, where pilgrims make ablutions to purify themselves before heading deeper into the grounds. 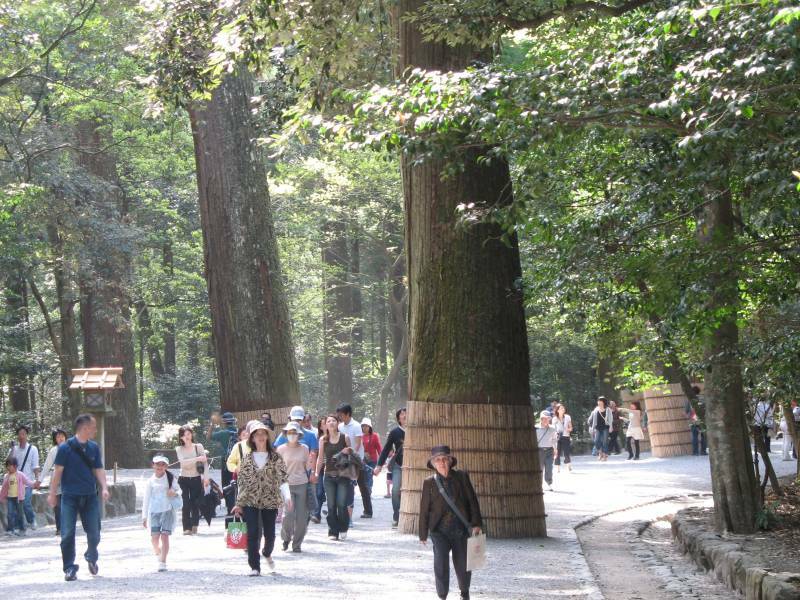 In the forests around the shrines, woodcutting has been forbidden since the shrines’ foundation. The trees are mostly hinoki and sugi. 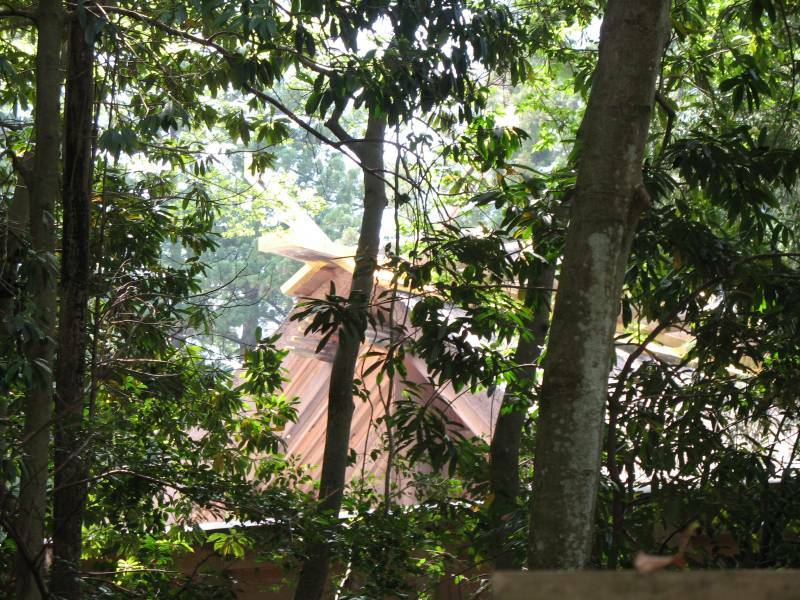 The large quantity of timber needed for the reconstruction comes from an expanse of forest beyond the untouched center. And this is the center of the center. 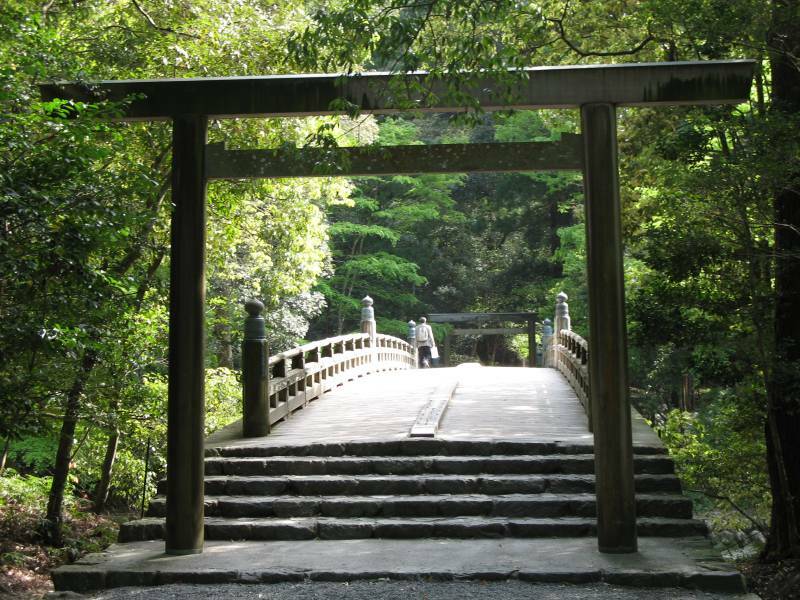 This bridge leads to a quiet sub-shrine. After visiting the Inner Shrine, I headed to a nearby shopping street, where the buildings are in Edo period style (1600-1868). It’s terribly touristy, but many of the shops do actually date from that time. This is a standing bar (is that the name? 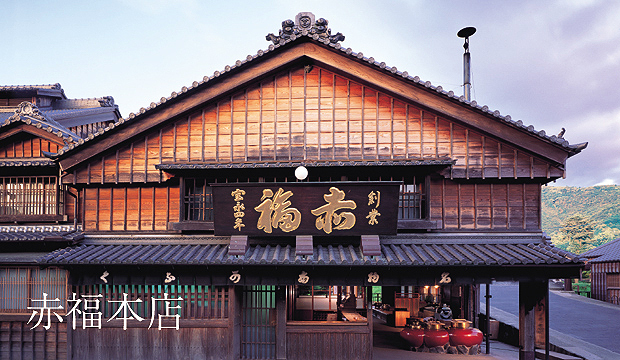 ), run by a sake brewery called Hakutaka, “White Falcon,” founded in 1862. 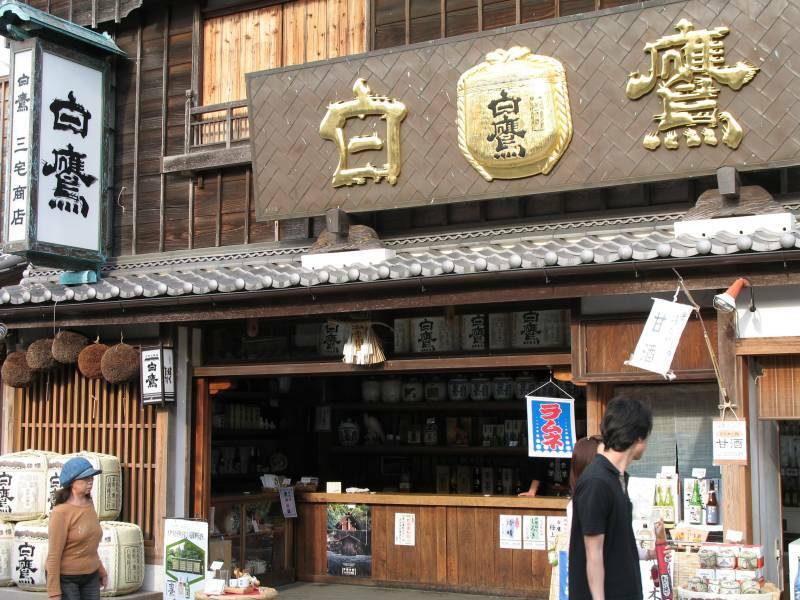 In addition to their ordinary business, Hakutaka also makes ceremonial sake for Ise Shrine. 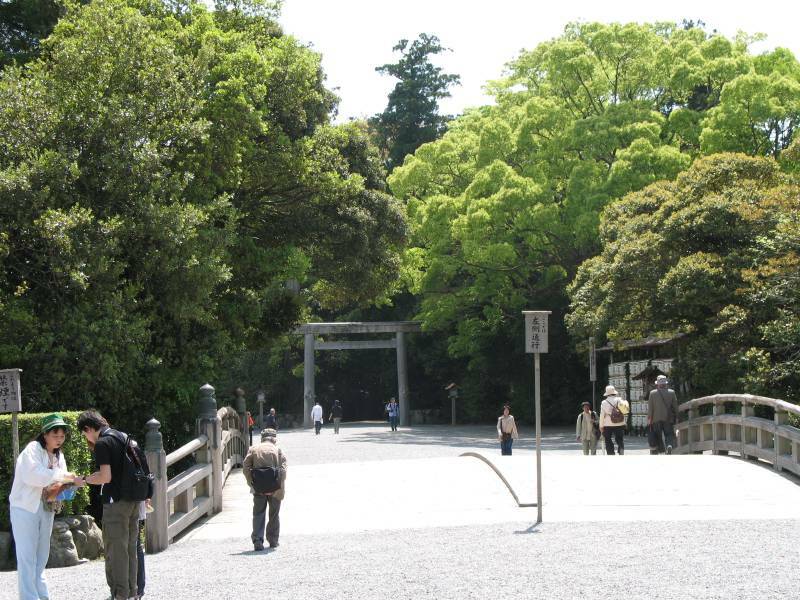 If you look at the picture of the Outer Shrine’s bridge, to the right are barrels with their name (白鷹). I had a cup of one of their expensive brews and it was quite good. 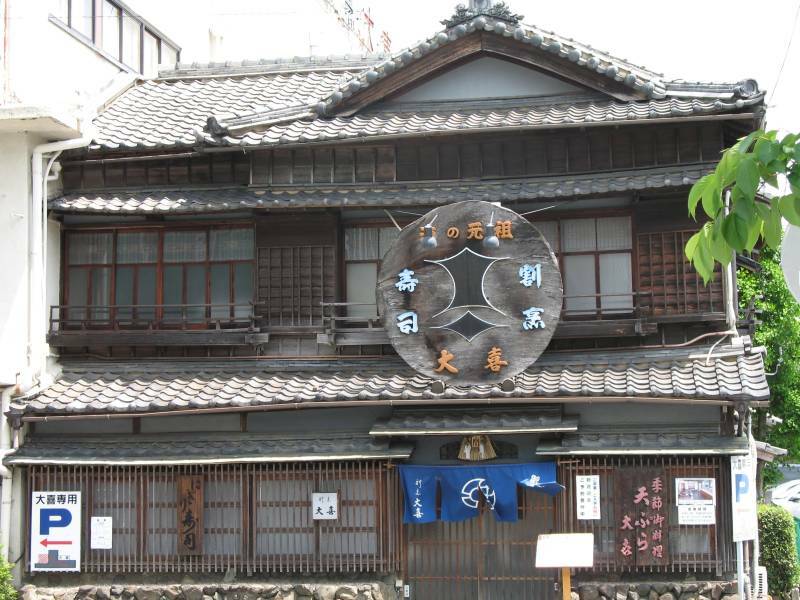 The other highlight of the shopping street was the head shop of Akafuku (赤福), a confectionary founded in 1707. They are famous for Akafuku mochi, which has sweet red bean paste on top, instead of inside. I stopped to have Akafuku mochi and green tea inside the shop. 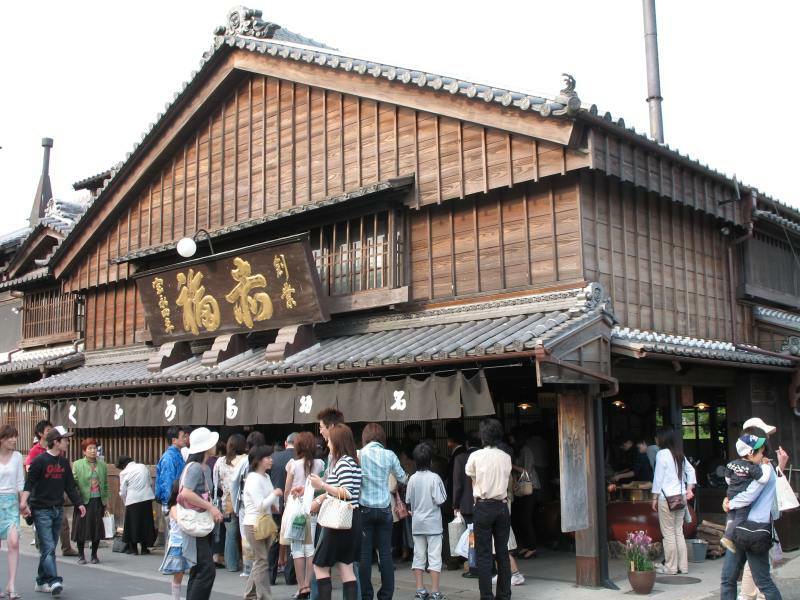 So now I’ve eaten at a 300-year-old restaurant (Imobō, in Kyoto) and a 300-year-old cafe. This picture from their website shows the shop minus the crowds. 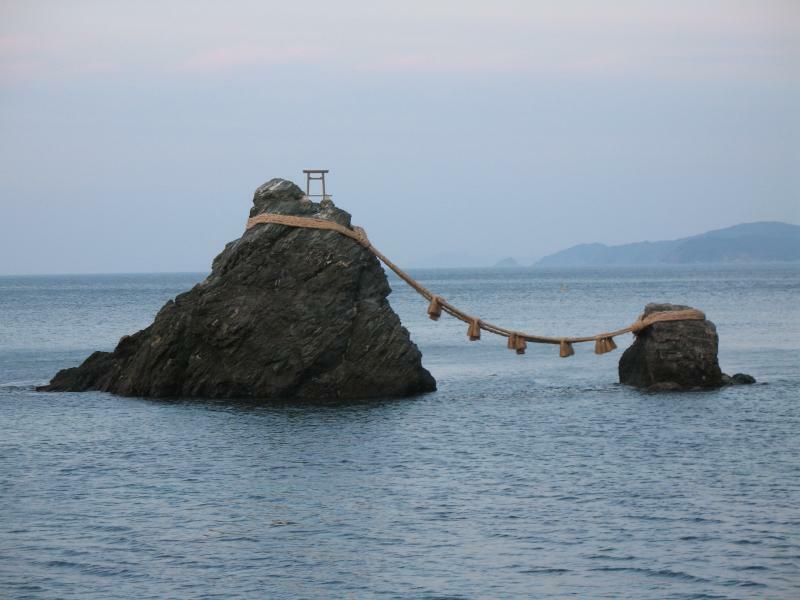 My final stop around Ise was to see the famous Wedded Rocks. Trivia: The rice-straw rope weighs over a ton. On a clear summer morning, the sun rises between the rocks and Mt. Fuji is just visible on the horizon. Alas, it was cloudy, spring, and late in the day when I visited, but at least the tide was in. Apparently it’s much less picturesque when the tide is out. After visiting the rocks I headed home, but I had a shock on my return trip. The train station near the rocks is just a few stops east of Ise, but it’s very rural. It doesn’t even have ticket machines or proper gates, just a drop-box. If you depart from there, you have to pay at your destination. Anyway, I returned to the station at about 6 o’clock to discover that trains only come once an hour after 5:30, and the station was even unattended. There was a taxi stand outside, but it listed the price for going to Ise station as ¥2,640, versus ¥200 for the train. Obscene. I resigned myself to the 40-minute wait for the train and had a further shock in that when it arrived, it was just one car. The train was on time, but other than that, the whole experience was nothing like what I’ve come to expect from the Japanese train system. I guess that’s when you know you’re really in the sticks. Alright, that’s it for now. Tomorrow morning I’m getting up at or before 5 to catch a flight to Tokyo. I’ll be back late on the 31st. Until then. You are currently browsing the Erratic Dispatches blog archives for July, 2007.